“Hello everyone! My name is Jack Mayor. I’m 17 and a soon-to-be senior at Neuqua Valley High School in Illinois. I became an Ambassador for Best Buddies last year and I am loving every single second of it and I will tell you why. Before I share my story about Best Buddies with you, I want to share some things about myself. One in 68 kids are diagnosed with autism and it affects one in 42 boys. I am one of those 42 boys. I was diagnosed with autism at the age of six. Life with autism is a daily struggle. I am different but I am also unique and I have been blessed with special gifts like super memory when it comes to calendars. Now that you know some things about me, I’ll get back to why I am here today. That is all because I found the best organization on this planet…Best Buddies. Before I became involved in this wonderful organization during my freshman year of high school, my life was very different. My life was very lonely. Although I have two brothers, and two sisters, I was sad. I was depressed and I hated everything about school. I sat alone at lunch and had no friends. That’s the thing with autism – it’s very hard to make and keep friends since most people don’t get me and I have a hard time reading people’s emotions. I did not want to go to school. My parents spoke to my teachers and then something absolutely amazing happened – I got involved in Best Buddies. Through Best Buddies, I met somebody that has become my very best friend. Josie is her name. I know that this is going to sound all dramatic, but it is the honest truth… Josie changed my life. She was the President of my high school’s chapter and I am sure she saw how bad my heart hurt. Josie would call my mom every week and make plans to do fun things with me. It wasn’t only the fun things she did with me, she took the time to get to know me… the REAL ME! She would always stop and talk to me in the halls, cheer me on at my basketball games and swim meets. She’d dance with me at Homecoming and Spring Fling. She also celebrated “Mayor Thanksgiving” with us, which included all 54 members of my immediate family. You see, Josie is part of my family. Josie gets me, knows me and loves me. Josie doesn’t see my autism, she makes me feel like my autism doesn’t matter. She gave me something that is priceless… her true friendship. Best Buddies gave me Josie. They gave me the confidence to speak in public. They also give other people with intellectual disabilities the chance to advocate for themselves. This organization makes me want to change things for all kids like me. Best Buddies took my worst days and made them my best. Everyone deserves their best days and every kid deserves Best Buddies. As an Ambassador, my personal goal and hope is to help get this organization in every single middle school and high school across the world. 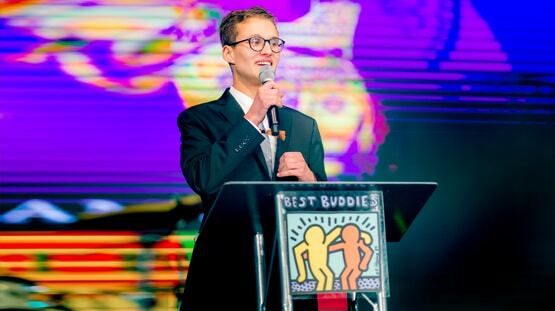 My take on Best Buddies is that all kids will benefit from it. Typical kids get involved and become great role models and leaders. Kids like me have the opportunity to walk away with someone who can change your life. I made a bunch of new friends. I actually like school now. I am extremely happy. My life starting my senior year is dramatically different from when I started my freshmen year and I know that this wouldn’t have been possible if it wasn’t for this organization. My heart, my soul and my life have definitely been enriched by Best Buddies. Thank you to Mr. Anthony Shriver for creating an organization that gave me hope, confidence and, of course, my Josie.